of the book cliffs. Lots of great sandstones and shales. Pacer/Crew for Vermont 100 and Leadville 100? So earlier this year I signed up for my first 100-miler....the Vermont 100. 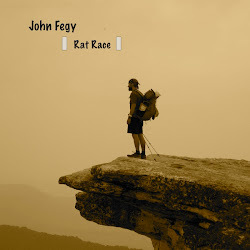 This race is to be my 2009 goal for something new and exciting that I will do to will push myself to new limits. Last year I survived a couple of 50 milers and decided to go one step further. This past week I did something even crazier...I signed up for another 100 miler...without even surviving my first. I signed up for the Leadville 100. This was the race that I really wanted to sign up for to begin with, but I was worried it would be very expensive getting there. I was able to secure some cheap airfare and a hostel bunk that will make this trip actually somewhat affordable...so why not right? At any rate...I'm in desperate need of some pacers and crew for both of these races. If anyone is interested, let me know. It looks like I will have a person helping me for the Leadville, but most likely as a crew member...not pacing. It's been quite a busy past week for me. Over the weekend I drove up to Rochester for my sister's wedding. It was a great ceremony and everything went off without a hitch. She and Dion are now off on a plane en route to Aruba! Nice. Since getting back it's been very hectic. I've been meaning to put up another "Appalachian Trail Revisited" post...but have simply not had the time to think through my experiences. 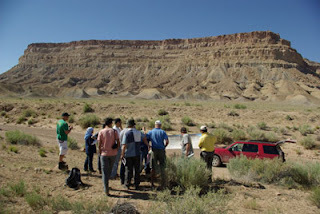 I leave on Thursday morning for Geology Field camp with 28 undergrad students. Me and one other grad student are TA'ing and there's a lot of logistical crap to organize before we head out. It's turning into quite a cluster. Hopefully we will get everything in order today and tomorrow and leave thursday morning stress free...but honestly I think it will be a mad hustle up to the last minute. Oh well....should still be fun. I'll try to update from the field...but I may be off the grid for several weeks. 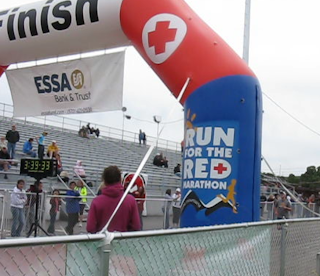 This past weekend I ran my second Pocono Marathon and it was a great experience. Last year, I made the decision to run my first marathon. The timing worked out that the Pocono fell right at the end of an 18 week training program that I wanted to start on January 1st. My goal then was simply to finish....in hopefully under 4 hours. After crossing the finish in 3:53, I was ecstatic....both goals accomplished! Then I had a major reality check. In the fall, I ran the Rochester Marathon. While the race started off ok, it quickly turned into a brutal heat fest. Temps skyrocketed up to nearly 90 degrees and the humidity was hovering around 95%. It was awful. People were collapsing, and being rushed to hospitals. At mile 20, the race was shut down. I had still not learned about the importance of taking electrolyte tablets in hot conditions and was quickly stricken with intense muscle cramps. I had to walk/limp for several miles, and crossed the finish feeling miserable, in a much slower 4 hrs, 33 minutes. I felt so deflated. How is it that I could run a marathon in 3:53, and then finish Rochester 40 minutes slower?! 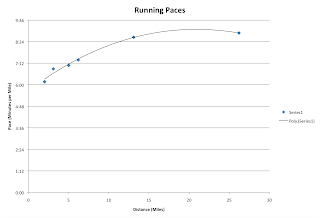 After rochester I shifted my running to trails and ended up enjoying running for endurance (for fun), and not worry about speed. I slowly built up my confidence again, and decided this spring to take another stab at Pocono. This time, my goal was to beat 3:53 and prove to myself that Rochester was not representative of my abilities. The weather for the race was supposed to be cool and cloudy...perfect in my book. I did not anticipate the gusty winds though, and when I toed the line at the start, it was extremely cold. I had actually grabbed an extra garbage bag from the volunteers and put in on as a windbreaker. The start went great, and I kept a vigilant watch on my heart rate monitor. I have learned that those first few miles, it is so easy to get over excited and burn too much precious energy that you will need on the "back 9". I happily let people pass me and made sure to maintain a sub 160 heart rate. At about mile 3, the course makes a quick u-turn and switches direction down the highway. This was nice, since the wind was now at my back giving me a little "push". I tore off the garbage bag (superman style), and ran on. I was feeling great at this point. From miles 10 through miles 20, the course winds through my favorite section of wooded country roads. I crossed the half-way point with a time of 1:47:02, nearly 5 minutes faster than last year! I was looking good, and still felt good. At about mile 18, I hit a nasty hill that I had remembered was where I hit the wall last year. I made it up and over, and still felt ok.....and pushed on. At mile 21, the course crosses over a bridge and continues for 3 miles uphill through what I consider to be my least favorite section. It is a tough way to end a race. It is all made worth it though when around mile 24 you start running through neighborhoods and seeing friendly people cheer for you at the end of their driveways. It was at this point that I still had not hit "the wall" yet, and my heart rate was still sub 160. I looked at my time, did a little math, and figured that if I pushed it, I might be able to actually finish with a sub 3:40 time! So, I flipped over my watch, and said to myself, "ok the rules are no longer in play....time to punch it!" For the last two miles, I ran way too hard, and way too fast, but I didn't care. 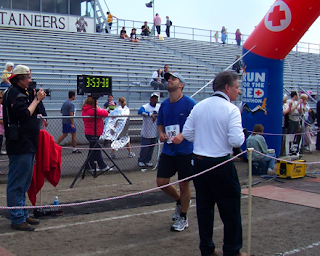 By the time I made it to the stadium at mile 26, I was already feeling empty, but I pushed on. I saw the clock was just about to pass 3:38 and I knew if I sprinted around the track I could make it. So, I gunned it for the last 0.2, and crossed the line in 3:39:36 (3:39:23 chip time)! I immediately felt vindicated from my performance in Rochester! Overall, it was a great race, and I was very surprised to have maintained 8:23 mile pace (considering my training runs were more like 8:45 pace). Of course now I've kinda screwed myself at ever PR'ing again. Oh well. Coming up to the Finish! Well it's that time of year again. 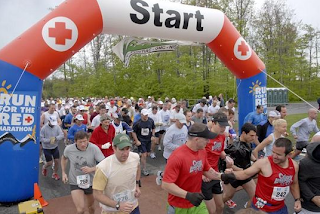 The Annual Pocono Marathon is this coming weekend and I'm taking a second stab at it. Last year I decided to start running and the Pocono Marathon was the race I picked to train for. I spent the entire winter and early parts of spring working my way through a Hal Higdon 18 week training routine that culminated on May 4th in Stroudsburg, PA. I went into the marathon with a very simple goal of "Finishing". In the back of my mind, I had a secondary goal of trying to break 4 hours. In all of my training runs, I had managed to maintain a sub 9 minute pace, so I figured unless I completely fell apart towards the end, I should be able to beat a time of 4 hours. All in all, not a bad way to finish up my first marathon! To this day, that time is still my PR for a marathon. So this weekend, I will toe the line for what equates to MY second annual Pocono Run for the Red, with the same primary goal I held last year....."To Finish". This year I'm changing my secondary goal to "Finish in under 3:53:13" (even if it's only one second faster). As far as weather....as of today, they are predicting low 60's/high 50's with overcast/rainy conditions. In other words: PERFECT running weather. Woo hoo. Hope this holds. Once this race is over, I will do a complete 180, and shift all of my training over to trails (at least as much as I can anyway). Two years ago today I was sitting out front of the Alpine Inn in Hot Springs North Carolina, enjoying a cloudless, cool day. I had just spent five high-mileage days getting there from Fontana through some of the toughest hiking on the Southern half of the AT. Somehow I had managed to fly through the 75 miles of the Smoky Mountains in just 3 days...averaging almost 25 miles a day. Heading out of Fontana was certainly a reality check. Whatever small step back towards real-life I had experienced, dissolved quickly on that first climb up into the Smoky Mountains. The first day in the smokies was tough, but I had great weather for it. Each time I passed a shelter caged in with bear-proof metal doors, I thought to myself, "I can go one more". About 7:30, I came up on completely packed Derrick Knob Shelter. It occurred to me that it was the weekend....I had kind of lost track of days. Generally, you are not supposed to tent in the smokies, but seeing as all of the shelter spots were full, I pitched my Lunar Solo, away from all of the crowds and made myself a nice dinner. At this point I was starting to become pretty accustomed to the Mountain House Spaghetti and Meatsauce dinners. I hightailed it out of the shelter at the crack of dawn, excited to finally break 6000 feet and set foot on top of the highest point. About an hour into hiking, a fellow thru-hiker from the shelter had actually caught up to me. He told me his name was 'Nature Boy' and he also wanted to try and knock out 25-28 that day. I kind of felt like some hiking company, so I stuck with him. He was a much faster hiker than me, but I managed to keep up. Being almost two weeks into the hike, all of my muscles and joints were really starting to ache and it was hard to keep a quick pace. Somewhere around lunch time, we finally popped out at the top of Clingman's Dome and made our way to the observation tower. At the top, I took a panning 360 video and you could really see how much the high altitude pollution is killing the trees in the area. At some point around this time, I was finally greeted by my first genuine trail angels. There was a couple that started asking the two of us about our thru-hikes. We told them all about the past two weeks and how our appetites were skyrocketing. (little did I know that this was actually called yogi'ing). It was then that they informed Nature Boy and me about the fully stocked cooler they had in their car that they weren't going to eat. They told us we could eat as much as we wanted, we just had to walk the .5 miles down to the parking lot. I don't think I can recall a time that I walked a half a mile that quickly. I guess I figured what's an extra mile round trip, when I was hiking 28 that day anyway. Needless to say, we devoured the contents of their cooler, and whatever was left, we stuffed into our packs for later. We pushed on and eventually split up. I pushed on the to the Peck's Corner Shelter (My planned 28 miles), and Nature Boy held about 5 miles back at the previous shelter. We both had planned on hiking into Standing Bear Farm Hostel the next day anyway. I ended chatting far in to the night at the Shelther with 'Hulk', another thru-hiker. The next day, I hiked out early in order to make it out of the smokies, and into the Hostel by 5 pm. It was about 23 miles, and I knew it was some tough hiking. The day went by fast, and I past over the last few 6000 ft peaks in the smokies. At about 5 o'clock I came out of the woods onto a road and made my way towards the Hostel. From what I read in the Thru-Hikers companion, the hostel was a bit 'eccentric'. After rolling in, and meeting the owner, I decided to go all out and pay an extra 10 bucks to get a full bed in the extra 'cabin', as opposed to the bunkhouse. I was then informed about the junkfood house....literally a small cabin full of junkfood that you buy on the honor system. At some point around 9 pm, Nature Boy rolled in and we talked for a while about the Long AT map on the wall of the bunk house. It was cool to finally be able to see some progress that we'd made. It was also that night, that I started noticing I had some swelling in my left big toe. It looked like it was getting a little infected. I put some neosporin on it, and forgot about it. The next day was pretty uneventful. It was rather rainy day of moderate hiking. I did get to hike up and over Max Patch. It was a rather interesting experience seeing a completely bald, grass covered mountain in the middle of no where. That night I stayed in the Walnut Mountain Shelter with a great group of folks including Nature Boy. The Walnut Mountain Shelter ended up being the worst shelter on the entire trail, but I didn't know it at the time. I just remember thinking...."this shelter looks like it's about to fall apart"
The next day I bolted out of bed early, because I knew it was an easy 14 miles into Hot Springs....a town I couldn't wait for! I couldn't wait for a bed again, I couldn't wait to make some phone calls, and I was finally considering taking my first zero day. I had heard a lot of good things about Hot Springs. I rolled in to town about 11 and met up with Nature Boy at the local greasy spoon diner (which turned out to be one of my favourite food stops on the entire trail). I ordered a fully loaded breakfast, got the completely wrong thing, but ate it happily all the same! I didn't care. Good coffee, good people, good food, and good relaxation => good stuff. The local hostel was all booked up, so I got a room at the Apline Inn, and turned the rest of the afternoon into an easy day of relaxing. I called home, did my laundry, and had some good town food. I made a couple trips up to the outfitter, and even hung out at night with the same crew from the shelter the night before watching a basketball game on TV. 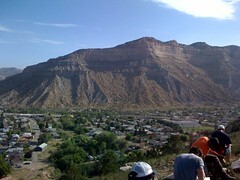 It was a great town, full of great people, and I was excited to be relaxing....but also excited to be thru-hiking. The only bad thing was that damn toe was getting worse....arggghhh. My Running Is Comparable To A.....3rd Order Polynomial? Huh? If you include my 50 miler in the plot it makes the trend more linear...but trail running and road running are two totally different things. ok...that's all the dorky math you are getting out of me today. I even won a utility ultra-running belt in the raffle! woo hoo! 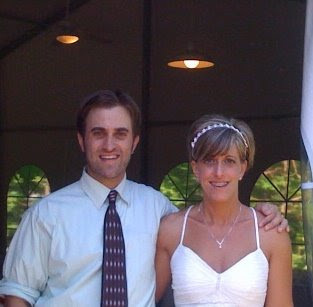 May 8th, 2007 was a pretty damn good day. I had survived my first 163 miles of the A.T. and found myself in my first soft bed in over 8 days. Somewhere in the past week, it finally set in just what I was setting out to do, and just how massive an undertaking I had begun. Up until this point, it was all more or less "on paper" and the reality was finally setting in. I arrived at the road junction outside Fontana Dam about 1 pm where there was a shuttle van waiting to take me into town along with a few others waiting nearby. The driver said that they generally send a shuttle every couple of hours to check for hikers. I decided to hold off on the shuttle ride and instead hike the 1+ mile all the way up to the dam itself so that I wouldn't have to do it tomorrow morning. Right by the shuttle stop there were some public restrooms with a soda vending machine out front. I remember thumbing through my homemade, duct-tape inspired wallet for a single....only find 2 twenties. God was playing a mean trick on me I think. I remember plodding the next mile up to the dam, and not being happy about it. It was a feisty little section, and it was the hottest part of the day. Once I reached the dam, I called the shuttle company from inside the visitor's center and said, "do you remember that guy that turned down the ride about a half an hour ago?...Well I need a ride now from the dam into town." I was hoping to get to town before 2 so that I could pick up my first post office drop box and bounce box, sort through them, and still have time to resend my bounce box up ahead to Hot Springs before the PO closed at 4:00. Maybe even send a few postcards if I could. Before I left, I had made a small notecard with the names and addresses of over 10 people/families. My plan was to send a slew of postcards to every name on that list, every time I hit a trail town or made it to a post office drop. A lot of fellow hikers were staying at the free shelter near the dam, affectionately dubbed the "Fontana Hilton" due to the fact that there were free-for-use showers. Somewhat of a luxury after 163 miles. I opted to pay up and stay some place a little nicer. I had been dreaming of taking a long bath for days. By the time the shuttle picked me up and got me to town, it was well after 2. I quickly got a room at the Fontana Lodge, pulled everything out of my pack to air it out, and hung my tent outside. After a quick shower (the bath would come later), I set off to find the laundromat and Post Office. Fontana Village was a strange little "town". It kind of had a feeling like it was out of a "Tales from the Crypt" episode. Everyone was a little strange, and people drove around in golf carts. It was a bit odd. The laundromat and PO were right near each other so I threw in my dirties (after sporting my rain gear), and picked up my drop box and bounce box. I spent the next 30 minutes back in my hotel room sorting my new food out, and taking what I needed out of my bounce box. I had it sealed back up and ready to send with just enough time to make it back to the PO before it closed. I quickly scrambled and frantically wrote out a couple of postcards before the clerk closed the window. I figured that I would send cards to everyone (including those that I missed in Fontana) in Hot Springs. After finishing up the laundry, I made my way to the town store to hop on their free internet terminal to post my first blog updates and to pay a couple of bills I had forgotten to before I left. I made a couple of phone calls, bought a pair of waldies camp shoes (similar to crocs), and made my way back to my hotel room. The rest of the night consisted of some more phone calls, TV watching, and a long bath. I organized all of my gear once it had aired out, cleaned out my Katadyn filter, and packed everything up for the morning. I also decided to start making some video blogs about my hike and recorded my first update from my hotel room. Before going to sleep, I spent a lot of time going back over the events of the first 8 days. The flight from Rochester went well, and my shuttle driver (Gil from North Georgia Outfitters) picked me up promptly from the MARTA station. I remembered how quick of a reality check it was to climb the approach trail in 80+ degree weather with swarms of bugs hovering around my sweaty and out-of-shape body. I remembered standing on top of Springer trying to find a place to mount my camera for a timer shot, only to have them all come out pretty badly. I remembered sitting on the grass in front of the terminus plaque watching the sun get low on the horizon and thinking about how my dad would probably think I had gone crazy. I remembered how those first few miles just seemed like any other walk in the metropark...and, was I really in Georgia on the AT? The first two nights on the trail I had decided to tent and I remembered, just how awful it was in that first shelter to hear some of the most obnoxious snoring I've ever heard. Waking up in the middle of the night and asking the hiker next to me if she also thought that the guy at the other end of the shelter was dying of sleep apnea. I tossed around fresh memories of my first full day of rain-hiking and meeting some really good people.... the likes of, Atomic, Stitch, Figgy, and Duffy. I smiled myself to bed thinking of my first sensation of hiker appetite as I came into the NOC and ordered all sorts of crazy food at the cafe'. For the first time in 8 days, I began to realize that it wasn't going to be 100 days of solid hiking without any breaks. I would get nights like these where I would feel I had actually earned the nights stay in a soft, cushy bed. Just before falling to sleep I started what would be come a nightly ritual of glimpsing in to my thru-hikers companion and flipping through maps to make a rough plan for the next day. I knew I had 3-4 tough days of Great Smoky Mountain hiking ahead of me and it wouldn't be easy. Just got an email from the Vermont 100 Director informing me that they received my service requirement form and that I'm now officially registered! woo hoo. The end of the year Geosciences party, appropriately named "Entropy", was held this past Friday here at school. I was a co-chair of the committee set up to organize the whole event...so last week was a bit stressful for me. In spite of this, however, it was a great time and everyone seemed to have a blast. Penn State Geosciences Goes "Office Space"
Well It's May 1st, and that means exactly 2 years ago I was making my way up the approach trail to Springer Mountain with the crazy notion in my head that I might actually walk for 2174 continuous miles. Hiking the Appalachian Trail had been an idea that I've had in my head ever since I was a kid and I asked someone what the dotted line on the road atlas was that went through all those states. After hiking with my good friend Pat in the Smoky Mountains, I had made the decision that the time to attempt a thru-hike was near. Add on top of all that the fact that 2005-2006 were the worst two years of my life, I knew a thru-hike was probably the only way I would be able to settle my very uneasy soul. I spent a lot of time reading peoples blogs and journals and educating myself on gear and trail info. What seemed like an impossible logistical task, slowly became a manageable reality. On May 1st, I boarded a plane in Rochester NY bound for Atlanta and took my first step onto the Approach trail just before noon. By 5pm that night, I was standing atop Springer Mountain and taking my first step on to the famous Appalachian Trail. 107 Days later I was standing on top of Mt. Katahdin in Maine with all 2174 miles under my belt and and was calling myself a completed thru-hiker! Since then, I can't complain. I have had a great experience here in Graduate School at Penn State and made a lot of new friends and colleagues. I have had the good fortune to spend several weeks in Colorado and even squeeze in time to thru-hike the Colorado Trail last summer. This past fall and winter, I spent a few months down at a field camp in Antarctica and then got to do a few weeks of hiking on New Zealand's South Island and Stewart Island. In between all that, I've been able to get back into running and take a stab a few ultraruns. This coming summer I have my first 100 miler scheduled and I just might try to maybe squeeze in a small 2 week hike (if I can get ahead on my thesis writing). 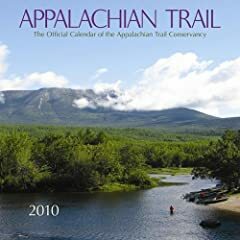 On a rather apropos note, today is the day that the 2010 Appalachian Trail Calendar is supposed to go on sale (although it is still saying Pre-Order this morning). This official ATC calendar features my Katahdin photo on the cover (and I believe for August). The ATC is now also accepting photos for the 2011 calendar as well.